The coded message that came into regimental headquarters that night said simply: "No rations, no water, no communications with headquarters ... four litter cases." Not too many miles away, on the bald top of a thickly-wooded hill, a battalion of 275 soldiers were spread out in an area 300 by 350 yards, digging their foxholes deep, using knives to whittle down trees to use as cover, folding blankets around the trees so that they would not make much noise when they came down. They were quiet because surrounding them on all sides, somewhere among the closely-grouped tall pines were approximately 700 Germans. They were quiet because they knew they were a lost battalion and they didnt want the Germans to know it. They had already had their first taste of the hell to come. Not only was their CP overrun, but the Nazis had thrown two full companies at them, coming from different directions, followed by an immediate buildup. That, plus heavy shelling, intense small arms fire and concentrated counterattacks they had somehow managed to beat off. 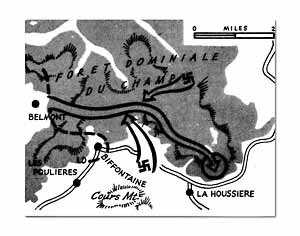 The 1st Battalion, 141st, after attacking east from Belmont over a thickly forested ridge line, was cut off by German attacks on its flank and rear. Now they were digging in, tending the wounded, sending radio messages, One of those wounded was the communications sergeant who had composed the first message. Artillery observer Lt. Erwin Blonder, Cleveland, Ohio, took over, hugged the only 300 radio, slept with it, prayed over it, from then on. From then on . . .
"Do you know what I kept thinking?" said Pvt. William Murphy. "I kept thinking how wonderful it would be to be back on my old job as street car conductor in Chicago. And I kept thinking that now I finally had something to tell my three kids when they grew up. Ysee, Ive never been in combat before. Im a replacement. This was my first time. But Ill tell you something funny . . . honest to God, I wasnt scared . . . I really wasnt." But a lot of guys were scared. The oldtimers knew what the score was. Theres not much you can do when youre cut off like that, with only so much ammunition, with no water, no food, no nothing. Still, there were simple, essential things to do. The four lieutenants on the hill formed an advisory council with Company As Lt. Martin Higgins having the final say. A little guy from Jersey City, a 28-year-old cavalry officer who had come to the infantry only five months before, he had a lot of decisions to make. First came the defense problem. Quickly, the companies spread out in a complete circular defense, with light and heavy machine guns strategically distributed. There would be no surprise attack. Then came the shakedown. Every soldier emptied his pack so that the battalion could pool everything. They collected everything from small stoves to gasoline and a few precious chocolate bars. But these things didnt last long. And then, very soon, the water situation became critical, more critical than the food shortage. Finally they found a mud puddle out of their area. It was dirty-stagnant, but it was water. They could boil some of it for the medicosnot much. Even the smallest fires caused smoke, which might give away their position. They couldnt get this water whenever they wanted it. They had to crawl quietly during the blackest part of the night, with their fingers itchy on their triggers. The Germans were using the same water hole. Headquarters understood the full significance. Already different sets of alternate plans were being made, different battalions were pulling into line. Headquarters was figuring out just how much, strength was needed to punch a hole and make the junction. To the 275 lonely men on the hilltop they radioed: "Hold on ... heavy force coming to relieve you." Headquarters threw in crack troops, the men of the 100th and 3rd Battalions of the 442nd Regimental Combat Teams, wiry little men who went into battle carrying twice what they would need, just in case, tough fighters who were fighting a war for a cause, adaptable, certain soldiers. With them S-Sgt. Eino Hirvi, Daisytown, Pa., had volunteered to lead his platoon of lighter tanks, carrying rations and medical supplies. Tank, had never fought in such terrain before. Along their flank drove the 2nd Battalion of the 141st. But the Germans had a heavy force, too. They had self-propelled guns parked all over the hillside, the whole area planted with every kind of mine, they had thick concentrations of mortars and machine guns and supporting artillery and tanks and fortified road blocks. The first attempted breakthrough was thrown back. On the hill the men tightened their belts, crowded together to keep warm, to talk. Behind the lines, every night, trucks loaded with field stoves and rations moved up the broad zig-zag engineer road and waited, just in case. "We used to talk about food, mostly," said 1st Sgt. William Bandorick, Scranton, Pa., smacking his lips unconsciously. "We talked about chocolate cakes and bacon and eggs and everything that our mothers and wives used to make for us back home. I remember once we spent a whole afternoon just talking about flapjacks . . . golden brown, with butter." They starved for five full days. Some of the men grubbed for mushrooms, trapped birds. They had very little luck. There was absolutely no food at all. The shelling got heavier. On the third day up there, they buried three more dead. It was a simple service, just a few prayers. Somebody marked down the location for the GRO. Nobody talked about it much, but inside themselves everybody kept wondering: How much longer . . . who next . . . Still morale was high. There wasnt even the faintest whisper of surrender among the men. And anytime Higgins asked for a volunteer patrol, he had his pick of the whole battalion. He sent a thirty-six man patrol out on one flank. It walked straight into a trap. Five men got back to the besieged companies. One, Pvt. Horace Male, a replacement from Allentown, Pa., got through. It took him five days of wandering through German positions, of not allowing himself to relax for a moment, but staying on his feet for five. foodless days of anguish. On the fifth day, a patrol found him and brought him in. No one else got out. Blonder hoarded his radio batteries, only a few messages could be sent each day. These told the story. "Send us medical supplies, rations, water, blood plasma, cigarettes . . . send us radio batteries." Back at headquarters they tried to use the big guns to shoot shells loaded with D-rations and aid packets. The first attempt didnt do well. The precious packets buried too deep in the ground or the shells burst in the tree tops, scattering the supplies. Then they tried to use P47 fighter-bombers of the XII TAC to drop supplies from the air. To signal the planes, the doughboys chipped in underwear and the white linings of parkas and maps, all of which were stretched out in a long white strip. As a double-check, they tied smoke grenades to saplings, so adjusted that when the planes came over the doughfeet could release the bent saplings and pull the grenade pins, so that the smoke could explode just as it topped the tall trees. The first try missed, by one hundred yards. "We were just praying, thats all," said S-Sgt. Howard Jessup, Anderson, Ind. "We just sat in our foxholes, listening hard, not saying a word ... and we just prayed." On the afternoon of the fifth day the food-loaded shells and the belly tanks of medical supplies and rations and batteries began hitting the target at the same time. They could loosen their belts, but they couldnt relax. They were still completely cut off; they were still the lost battalion. On the morning of the sixth day, Lt. Higgins was writing a letter to his wife when he suddenly signed off. "Time out for a while, Marge, Ive got work to do." It was more than work. It was the strongest attack the Germans had made. The planes and shells had finally told them the story. They attacked, certain of easy meat. As a prelude, they dumped a terrific artillery barrage on the area. Then they rushed one sector of the defensive circuit. Fortunately, the Germans picked the one spot where the battalion had concentrated most of its heavy machine guns. The guns were shooting single fire until the Germans came along close. Then they cut loose with everything. The gunners had been told not to fire until they were sure they had a good target in their sights. "We weret firepowering, we were collecting," said Lt. Higgins. The collection was phenomenal. The Germans took an awful beating. In the fringes of the small brush, just where the forest ended, there were dozens and dozens of dead Germans. The artillery made a fine collection, too. Spraying the whole wooded area with tree burst when the Germans left their covered holes, the artillery accounted for one pile which had two hundred and fifty German stiffs in it. On the afternoon of the sixth day, Sgt. Edward Guy, New York City, was on outpost when he saw somebody. He strained his eyes looking and then he raced down the hill like crazy, yelling and laughing and grabbing the soldier and hugging. Pfc. Mutt Sakumoto just looked at him with a lump in his throat and the first thing he could think of to say was: "Do you guys need any cigarettes?"